Fast-paced, action packed with fantastic kid characters who battle evil while using prayer as their ultimate weapon? Doesn't get much better! Or, as my boys would say, BOO-YAH! This is a winner with kids and parents alike; kids, because the characters are relateable and get a chance to be involved in a great adventure and parents, because this is a scripture based battle of good versus evil. 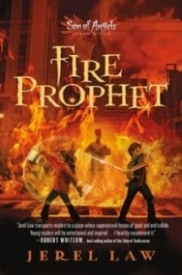 Fans of Percy Jackson and The Kane Chronicles will no doubt enjoy Fire Prophet (as well as book one, Spirit Fighter)! Usually, I don't read much Middle Grade Fantasy novels. I enjoyed Harry Potter series and Neil Geiman's Graveyard Book, and was not so-impressed with The Chronicles of Narnia, but that's it. Son of Angels series by Jerel Law intrigued me with promises to be Christian answer to popular middle grade adventure series like Percy Jackson and the Olympians & The Kane Chronicles. Making Christianity and the Bible exciting for kids? I was curious how it will turn out. "Johan, you are not entirely human. You're mostly human, just not... totally." Jonah's mother is nephilim, half angel and that makes him one quarter angel - quarterling. Jonah is suddenly stronger and faster than his friends, one of the perks of having angel ancestors. But that's just the start of him discovering his powers and what is he capable to do. Turns out nephilims and quarterlings are very powerful creatures, and as always there is someone who wants to use them for bad and nefarious purposes. Good thing they will have help of Elohim (God) and his angels. Frankly, this book was not as bad as I expected. Hmmm... That came out wrong. :) Actually, it was not bad at all. Story is told from Jonah's point of view and I liked that he's not perfect and that's he's often troubled by doubts, jealousy and other problems. Jerel Law painted a perfect picture of young coming of age boy. Sadly, all other characters pale compared to Jonah and feel a little shallow. While Jonah is painted with different shades of gray with white light of faith shining trough them, other characters are more black or white and not very complex. I recommend this book to fans of: middle grade fantasy and adventure who don't mind having a little bit of Bible quotes and Christianity teachings added to the mix.